Deezer: It is indeed Mawaru WarioWare, for GBA. Mawaru means "to turn" or "to revolve"; the game cartridge will have a sensor that knows when you turn the GBA to the right or left, and most minigames should make use of that. Hey to everyone at TMK...what's going on. I love the site alot. If yall don't mind...I have a couple of questions. First one, I've been LOOKING everywhere for a crystal-clear image of an official image of Luigi from Super Smash Bros Melee....it's gotta be like the one of Mario on the front page of the site from that game. I would be very greatful if you could help. Second, is there ever going to be more mp3 samples for download from the "soundtrack" section? Thanks a bunch. Deezer: I plan to add MP3 samples on some of the newer soundtrack pages. It's not my highest priority right now, however. Hey guys! How are things? Anyway, I have a question to get off my chest. I e-mailed you guys a couple of weeks ago asking if you had an official image of Luigi from Super Smash Bros Melee. What happend to that letter? I never saw it in the mailbag! Do you have that image? My second question is this...I ran across a site called The Super Mario Super Site that no longer gets updated. But I noticed that the webmaster's nname is Megabyte. So did you work on that site Megabyte? If so, why did you quit? If that's not you...then you should sue him for copyrights or something. Thanks for your time guys! Lizard Dude: David was one of those kids who played games on large screens with no backlighting in the room. Now you know why not to do it. MEGAß¥TE: No, that wasn't me. The webmaster's name was MEGAByite, though the site indeed wasn't the most original out there... anyway, the SSBM Mario image on the splash page isn't a render as in a pre-render, it's a GameCube render. 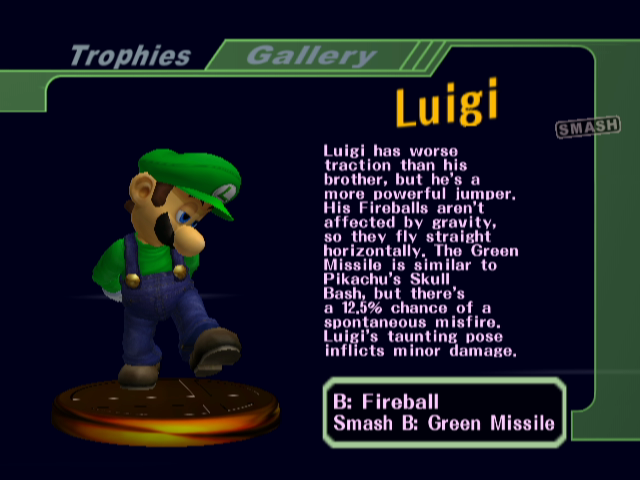 I grabbed a shot of Luigi's trophy for you, though it's not the greatest pose. Hi again! I was wondering if you have any new info on Super Mario 128 like what it is and when its coming out cause I know you don't update your site very frequently. "I wish I could tell you everything! But it is TOP TOP secret! It's so secret they wont' tell me!!!! But i can tell you...my voice won't change....Mario is'a Mario! I can tell you that I know it is going to be awesome!" Ok, I draw the line here. You took way too long to answer me. But I am a nice person, so I will quench my thirst for answers. 1) Are your caricatures accurate? 2a) Will Paper Mario 2 be good? I want it. 2b) Will I need the strategy guide? It took me four years to beat SMB, and 6 months for SMA WITH the guide. 3)What happened to Sapph? Did Mushroom Boy kill her so he could have her spot on the Mailbag? 4)I understand that you have lives, but I might stop writing if you don't update your site more often. 5) What is SM128? I will ask that every time. Wow. My first long email. Hmm. That was fun. Deezer: 1) They are as accurate as caricatures get. 2b) I would suggest to play it without a guide until you get stuck. Aren't games more fun when you figure out stuff on your own? I guess if you get stuck/frustrated easily you should get the guide or visit GameFAQs. MEGAß¥TE: 1) Please see the definition of caricature. 2a) I also hope so. 2b) If what you said is true, no guide is going to help you. 4) Good. Maybe we'll actually have time to update instead of reading garbage like this. Lizard Dude: 1) Yes. We are quite two dimensional. 2a) Yes. It will be good. 2b) Yes. But don't use it. 4) I understand that you don't have a life, but I might start writing if you do update your mailbag submissions more often. Chupperson: 1) We have misshapen features, as shown. 2a) Yeah. From what I've played though, I like Paper Mario better. 2b) Wow ... it took me like a week to beat SMA. Without a guide, I might add. 3) I grieve for my poor departed sister. 4) I seem to have a life and also seem to spend a good deal of time hanging around TMK. I wonder how that is. Sapphira: 1) Please see the above responses. Oh, and yep, I love having beady little eyes ._. 2a) How could it not? This is a game I plan to buy immediately, withOUT even playing it beforehand--even in demos. 2b) Meh, you don't need no stinkin' guide. Unless you get it for free, of course... Play it through for as far as you can get, and if you struggle, keep on at it 'til you get it, and if you STILL need help, then use gamefaqs as a last resort. Much cheaper--and FUN!--that way. David Dayton: 1) Only on weekdays with a U in them. 3) We sold her off to pay for our DS units. 4) Is that a promise or a threat? 5) A collection of ASCII characters. You have a nice site. Its very colorful and nice. 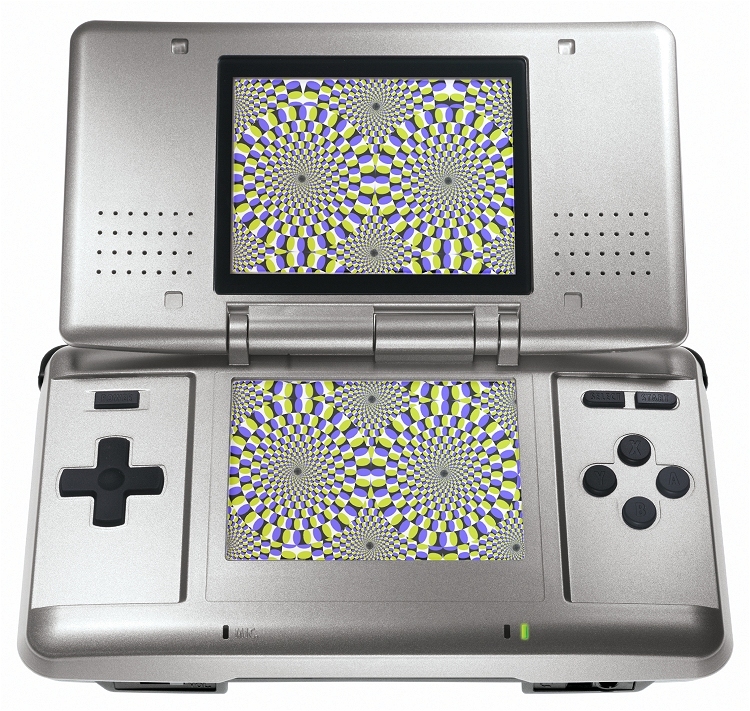 I just have a few questions about the DS and other things: 1) How can you focus on two screens at the same time on the DS? 2) What are the size of the DS game paks? 3) I haven't heard much about the PSP. What are its features? 4) I'm looking foward to Paper Mario: The thousand year door! How about you? Thanks for answering! Deezer: 4) It comes out today, w00000000000t!!! To answer your question, yes. Lizard Dude: 1) Generally, both screens won't have frantic action going on at once. One typically acts as a map or different view or menu while the other shows the main action. I expect some games like Wario Ware, however, will use the two screens to intentionally force you to split your attention and add challenge. For a great excercise in that, please play Arcadia. David Dayton: 1) Very carefully. 2) Physically small, but with a rather impressive memory capacity. 3) It costs a lot and runs batteries down quickly. 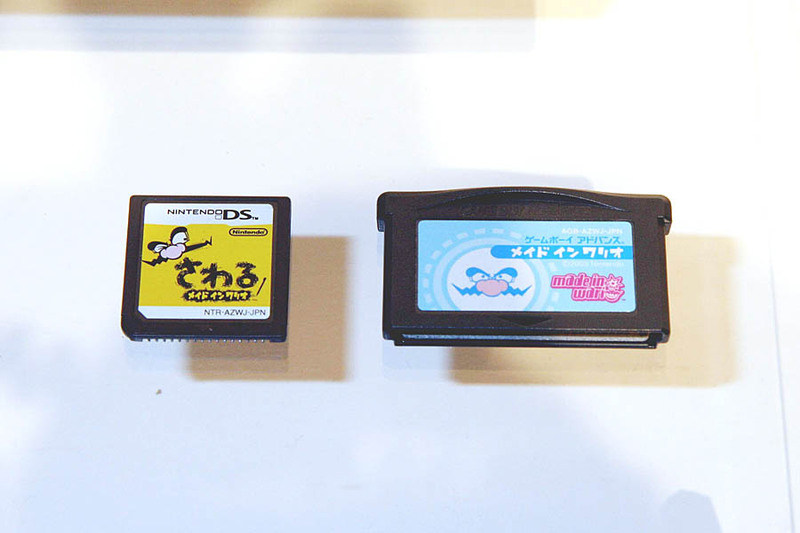 2) DS card - GBA cart comparison - the cards are approximately 1.25 x 1.25 inches square and a few millimeters thick. 3) Here are the specifications released last year. Note that price and battery life are conspicuously missing... we still don't have solid numbers for either. Misters D, Chup, Byte, Boy, J, and Miss Sapph... will you be getting a domain name soon, or are you keeping your classicgaming account? i mean, having www.mushroom-kingdom.com would rock or something but then you're probably on a budget or something. oh, and, um, what's the square root of infinity? MEGAß¥TE: Okay, Deezer registered themushroomkingdom.net. Happy now? Lizard Dude: No one addresses letters to me. Ever. You can't really take the square root of something that is not a number or something that represents a number, but I suppose the square root of an infinitely large number would be infinitely large itself. Deezer: I did it just for you, Sunbun. Actually, I did it because it was really cheap. David Dayton: Too bad tmk.com and such are all taken. MEGAß¥TE: I still think we should get bob-omb.com. Sorry if these are fake or if this is old news, but when searching on google I came across these screenshots claming to belong to Super Mario 128. And I'm pretty sure this isn't something from that Super Mario Univerese hoax. MEGAß¥TE: Yes, they are both fake and old. Lizard Dude: Just like Grannies With Botox. David Dayton: Do not believe everything you read on the internet. George W. Bush: I hear there's rumors on the internets. Have you ever considered starting a Cafepress store? I'd certainly buy stuff, especially a shirt roughly along the lines of your "20 years of Mario" opening page. Thanks. MEGAß¥TE: While we might like to do something like that, it would be a really bad idea for us to start selling copyrighted / trademarked material, especially now that Nintendo is selling similar items. We most likely can't afford the licensing fees associated with legally running such a store. Maybe we could just have merchandise with the title logo, but then would you buy one? Deezer: Yes, I have considered it. Chupperson: I need to make me one'a them thar shirts. David Dayton: I think we're waiting for Reggie to offer us the exclusive U.S. rights for Nintendo merchandise. I'm baaaaaaa-- ah never mind. Hey, how are you all doing? It's your lucky day! I decided to just skip the intro and dive right in to the stupid questions instead of blabbering on about birthdays and stuff. But before I do I'd just like to tell you that my Windows Media Player is working fine now and the music is near-perfect. I updated to the newer version and the problem isn't as bad so you can all stop worrying about me! Okay, time for questions. (1) With October just around the corner, I've been thinking about Thanksgiving, and upon thinking about thanksgiving I have been thinking about the Macy's Day Thanksgiving parade, which in turn has led me to my question. Has the Macy's Day Thanksgiving parade ever had a Mario balloon? I looked all over the internet and couldn't find any, but maybe there was and I just missed it. If there isn't a Mario balloon I think there should be one. It could be a big one that has the raccoon power from SMB3 and is flying with his arms stretched out like in that one picture. And maybe there could be a brass band marching ahead of it that plays Mario music! That would be the coolest! So cool that I might actually watch it when it comes on! And maybe the Mario balloon could attack the Pikachu balloon and slam it into a building, like some kind of Super Smash Bros. Balloon Battle or something! And then the Sonic balloon would come back and... okay, I'm done now. (2) Do you know what that red liquid stuff is in the last world of SMB3 in the boat level? It appears to be lava, but you can swim in it so it couldn't be. When I was a little kid I thought it could be blood, but no Mario game, not even Dr. Mario, has blood in it! Is it just polluted water, or something else? Dumb question, but I really want to know. People have said a lot of things about Mario Kart:DD and I agree with most of it, but I don't really agree with them about their thoughts on Toaddette. Sure, it is annoying having a new character appear out of thin air, but it's nice to finally see a female mushroom person on the GameCube. We haven't see one of them since, like, Paper Mario right? Also, I thought of another character who would also be a good partner for Toad; Battle T from Mario Party 2 and 3! (ugh, why did that have to rhyme?) Almost everyone forgot about him, but he's about the only Mushroom person to be a good match and that doesn't seem out of place. What do you think? Would he be a good partner? (4) Last question, and this one is very stupid. Is there a difference between the starmans from SMB1-3 and the stars in SM64 and the Mario Partys? They look exactly the same but have different purposes in certain ones. They probably aren't the same but you never know. Wow, the letter is finished. It's my shortest one so far! "A new record!" Thanks for answering my questions. Sorry about the bad comic scan last time. Have a nice mailbag! MEGAß¥TE: (1) And then the Sonic balloon would come back and... crash into another light pole and injure some more people? (4) Yes, there's a difference. One is a Starman, which grants invincibility and the other is a Power Star. Lizard Dude: (1) And then the Sonic balloon would come back and... win first prize for its original use of flowers? (4) The stars in the night sky in Mario games are different still. Those are balls of hot gas. Chupperson: Who was worrying about your WMP? (2) Sure looks like mud to me. Sapphira: (2) Maybe it's sulfuric water. I still say Toadsworth would be most ideal... Eh, I don't have much of a problem with Toadette anymore, just her name; it's so uninspired. Chanterelle....now THAT was inspired. (4) MB stated it nicely. David Dayton: 1) No idea. 3) Female Mushroom folk have been around for quite a while now, so I'm not sure if Toadette qualifies as a "new character". 4) Only Miyamoto knows for sure. Yeah uhh... for the Nintendo Power Volume 141 it has a Paper Mario guide and on page 29 I found a errata thing. At the bottom right where it talks about Tutankoopa it says he fights with spells, spinys, and a powerful chain chomp. Tutankoopa actually uses buzzey bettle shells not spinys. MEGAß¥TE: I'm not sure if we want to catalog errata in a magazine. Nintendo Power is notorious for mistakes. It would take a whole separate website just to catalog them all. Deezer: I'm going to limit it to game text and manuals. Maybe NP's players' guides, depending on the situation. Chupperson: Then you'd miss all the errors those poor fools think are correct in the manuals. Hi to all the TMK Staff! I'm FD. I like your site! So anyway here's what I want to ask you. 1. What do you think of the future of Mario on the Game Cube? And what about the DS? 2. Would you have appreciated more to have the Famicom in America in place of the NES? 3. If the Virtual Boy was made today with all our new technologies, do you think it would have been a flop? 4. Did you liked the American SMB2 (a.k.a. SMB USA) ? 5. Did someone in the TMK staff ever played SMB2 the Lost Levels on the Famicom (not on SMAS) ? MEGAß¥TE: 1. Two very very nice looking games are coming up soon, Paper Mario: The Thousand Year Door, and Mario Power Tennis. There's also Mario Party 6 featuring the microphone peripheral. Things are looking good for the spin-off/side story games. If you're wondering about Mario 128, well we don't know what system that will land on yet... As for the DS, we still don't completely know how the Mario games play, but we have Super Mario 64 DS, Mario Kart DS, New Super Mario Bros., Yoshi Touch & Go, and Wario Ware, Inc. DS, all of which have some excellent potential. 2. Actually, yes. I just got my Famicom in this week, and it's so much smaller than the NES, it's not even funny. And while the NES's front loading system was kinda cool, I'd trade it any day for the significantly smaller Famicom carts. Also, the Famicom got the Famicom Disk System, and the NES did not, so we missed out on several of those games as well. The only real problem with the Famicom is that its controllers are hardwired... oh yeah, and its colors are quite ugly. 3. Probably, but not nearly as much as it did. Virtual reality inherently can cause motion-type sickness, and people like freedom in their games, not something stuck to their head. Even with today's technologies, it would either be expensive, or not particularly powerful. Hopefully it wouldn't burn batteries like the original did though. Such a device might become more popular as an accessory instead of a whole system like the Famicom and Genesis had, however they'd likely be too expensive to warrant a purchase. As a point of reference, 3-D shutter glasses for PC games have been out for several years, and they haven't become very popular. David Dayton: 1) It's coming? 2) Personally, I don't really care. 3) Depends on the price. 5) We're waiting for MB to do so. i've heard a rumour that you're able to unlock the game Mario Clash in my Evil alter ego's Mega party Games. but I didn't hear anybody about it. is it true ? is it possible to unlock Mario Clash ? MEGAß¥TE: There is a Mario Clash minigame in the GBA version, so it should be here too, but if you're talking about a full version of the game, then no. And you only wish you were Super Mario. Lizard Dude: There is nothing besides the Mario Clash microgame. Sorry. David Dayton: Just the minigame. For now. BWAHAHAHA! Lizard Dude: Yes...just the microgame. Rotating snakes image Copyright 2003, Akiyoshi Kitaoka.